Mental images of the swallow may conjure visions of sailor's tattoos and bright blue wings soaring through the air. When we think of sparrows, we might picture a small brown bird singing and hopping from branch to branch. There are several differences between these two birds, including plumage, shape and diet, which can be helpful to bird-watchers keen to identify their feathered friends. Perhaps the most remarkable feature of the swallow is the bright blue color of his back, wings and tail in contrast to his white or taupe underbody. Males and females share this trait, but males are more brilliantly colored than females. Sparrows rarely come in colors other than brown or gray, and the males' only distinguishing feature from the female is the brown streaking on his chest. 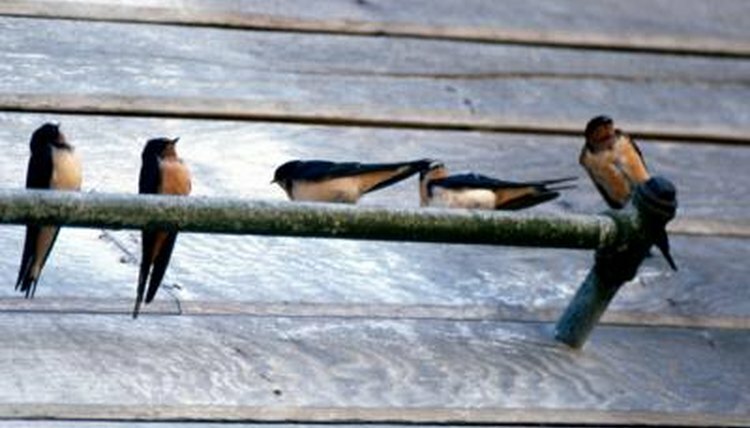 A swallow will have a cone-shaped body that is 15 to 19 centimeters long and a flat head, without a visible neck. His wings are long and pointed, and his tail may be forked or notched. A sparrow has a stocky body 12 to 18 centimeters in length with a rounded head and tail, and broad wings. Sparrows and swallows share a love of open spaces and a very large range of habitats, though swallows are commonly found near open water sources. Both species can be found all over the world, with the exception of Antarctica. Swallows most often feed while flying, snagging insects of the air as they soar over 100 feet from the ground. If insects are scarce, they may feed on small animals or plant matter. Sparrows prefer to make meals of fruit and seeds for the majority of the year, but prefer insects as their source of nutrition during breeding season, which falls during the summer season.